MailWasher Pro portable allows users to view messages that are on various email accounts, before you download them to your computer. With MailWasher Pro, you can delete or return unneeded letters back to the sender with a message that the recipient is unknown. Includes virus protection, provides access to POP3, IMAP4, SMTP, WebMail and WAP using SSL, provides filtering attachment / content-mail and MAPS / USER-DEFINED anti-spam database. Works with multiple domains, you can create automated replies notification by SMS, create a shared and public folders, backup mail database, and secure remote administration. Available anti-virus plug-ins from McAfee and F-Secure. There is the usual simple solutions in the form of black, white, a private list, renvoi letter with a note that the sender is unknown, preview, check-test of loyalty return address, an overlay of 25 e-mail message headers in the second, work on schedule, and more., Including Shared plugins antivirus from McAfee and F-Secure. 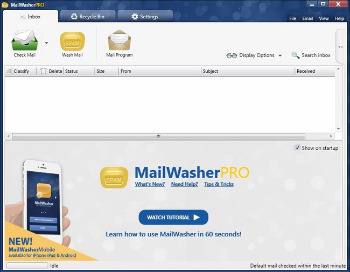 • Unlimited number of mailboxes, support for POP3, AOL, Hotmail & MSN and IMAP. • Cyclic check mail with an additional opportunity to specify the time when its conduct is not necessary. • Delete unwanted e-mails before you download the whole message. You’ll be able to see who the email is from, the subject, and the attachment. This will enable you to decide if you want to delete the email or keep it. A great way to stop viruses or large attachments. • FirstAlert! ™ Join the community of FirstAlert! ™ subscribers reporting spam messages and watch as even more spam disappears from not only your inbox, but the inboxes of all other FirstAlert! subscribers as well! • Analyse. MailWasher analyses each email as it arrives and warns you if it is suspected junk mail or a virus by heuristic checking and filtering. The standard status categories are – Normal, Virus, Possibly virus, Possibly spam, Probably spam, Chain letter, Blacklisted, Blacklisted by (ORDB, Spam Cop etc). • Blacklist. Any e-mails you bounce back get their senders details put on the blacklist for easy removal if they come back. You can even set it to automatically bounce and delete blacklisted e-mails, or whole domains off the server. Plus, MailWasher can use external blacklists such as ORDB and Spam Cop or you can specify your own. • Friends List. Add your friends email addresses to MailWasher and they will always be recognised. You can even hide your friends from the screen so the spam is easy to recognise. • Preview. Easily preview the message in your email to see what the sender has to say before downloading it. Just double click on the message. • Bounce back unwanted e-mails so it looks as if your email address is not valid. This will make the sender think your address is no longer active so your name can be removed from their list. This unique feature is great for privacy and it couldn’t be simpler! • Filtering. Effective filtering to automatically spot spam, plus it uses a customisable list of blacklisted e-mail senders and / or regular expressions to filter out potential spammer addresses and messages. • Email overlay. New messages will come in and will reside in the screen until processed. Fast download of message headers, we have clocked speeds of 25 email message headers per second. • Simplicity. No flashy gimmicks, so easy to use that you won’t feel like you have to learn a whole new program. In fact it has the familiar look and feel of Outlook Express. It’s as easy as 1,2,3. Just check mail, mark for deletion / learning, then process mail. • Other features: Check mail at different intervals. Don’t check mail at certain times. Play a sound when an email arrives, or be notified visually. Email log. Comprehensive help documentation on this site.